Fig. 117 Marginal efficiency of capital/investment. the RATE OF RETURN (PROFITS) expected on an extra pound's worth of INVESTMENT The marginal efficiency of investment decreases as the amount of investment increases (see Fig. 117 (a) ). This is because initial investments are concentrated on the ‘best’ opportunities and yield high rates of return; later investments are less productive and secure progressively lower returns. The amount of investment undertaken depends not only on expected returns but also on the cost of capital, that is, the INTEREST RATE. Investment will be profitable up to the point where the marginal efficiency of investment is equal to the COST OF CAPITAL. In Fig. 117 (a), at an interest rate of 20%, only OX amount of investment is worthwhile. A fall in the interest rate to 10% increases the amount of profitable investment to OY. If EXPECTATIONS change and investors expect to receive better returns from each investment because, for example, of technological progress, then at any given rate of interest (such as 20%) more investment will be undertaken than before; that is, the marginal efficiency of investment schedule will shift to the right, as shown in Fig. 117, and investment will increase from OX to OZ. Economists differ in their views about the interest rate sensitivity of investment. 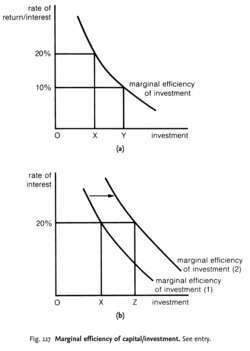 Some Keynesian economists argue that investment depends largely upon expected return and is not very interest rate-sensitive, so even large changes in interest rates have little effect upon investment (the marginal efficiency of capital/investment curve being very steep). Thus, such economists claim that MONETARY POLICY will not be very effective in influencing the level of investment in the economy. By contrast, monetarist economists (see MONETARISM) argue that investment is very interest rate-sensitive, so even small changes in interest rates will have a significant impact upon investment (the marginal efficiency of capital/investment curve being very shallow). Thus, monetarists claim that monetary policy will be effective in influencing the level of investment. Empirical evidence tends to support the Keynesian view that interest rates have only a limited effect on investment.